Proprietary Name: Ursodiol What is the Proprietary Name? Non-Proprietary Name: Ursodiol What is the Non-Proprietary Name? Ursodiol with NDC 68001-377 is a a human prescription drug product labeled by Bluepoint Laboratories. The generic name of Ursodiol is ursodiol. The product's dosage form is tablet and is administered via oral form. FDA Application Number: ANDA090801 What is the FDA Application Number? 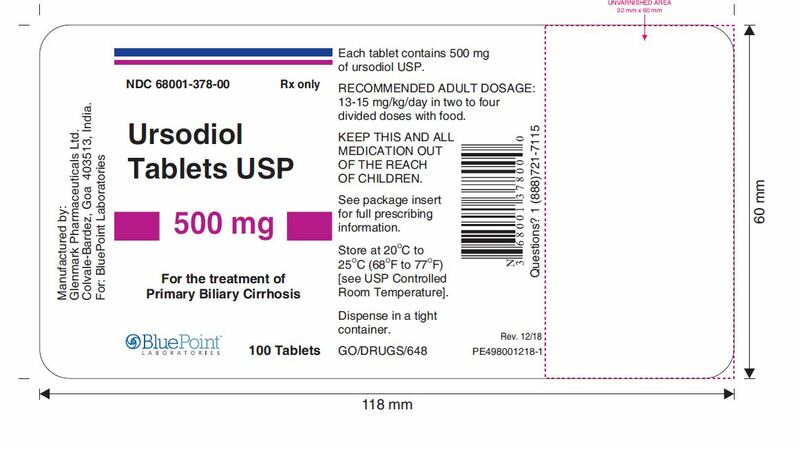 Ursodiol tablets USP, 250 mg and 500 mg are indicated for the treatment of patients with primary biliary cirrhosis (PBC). The recommended adult dosage for ursodiol tablets USP, 250 mg and 500 mg in the treatment of PBC is 13-15 mg/kg/day administered in two to four divided doses with food. Dosing regimen should be adjusted according to each patient’s need at the discretion of the physician. Liver function tests (γ-GT, alkaline phosphatase, AST, ALT) and bilirubin levels should be monitored every month for three months after start of therapy, and every six months thereafter [see Warnings and Precautions (5.1)]. The ursodiol 500 mg scored tablet can be broken in halves to provide recommended dosage.To break the ursodiol 500 mg scored tablet easily, place the tablet on a flat surface with the scored section on top. Hold the tablet with your thumbs placed close to the scored part of the tablet (groove). Then apply gentle pressure and snap the tablet segments apart (segments breaking incorrectly should not be used). The segments should be washed down unchewed, with water, keeping the segments in the mouth can reveal a bitter taste. Due to the bitter taste, segments should be stored separately from whole tablets. [see How Supplied/Storage and Handling (16.2)]. Patients with complete biliary obstruction and known hypersensitivity or intolerance to ursodiol or any of the components of the formulation. Patients with variceal bleeding, hepatic encephalopathy, ascites or in need of an urgent liver transplant, should receive appropriate specific treatment. Liver function tests (γ-GT, alkaline phosphatase, AST, ALT) and bilirubin levels should be monitored every month for three months after start of therapy, and every six months thereafter. This monitoring will allow the early detection of a possible deterioration of the hepatic function. Treatment discontinuation should be considered if the above parameters increase to a level considered clinically significant in patients with stable historical liver function test levels.Caution has to be exercised to maintain the bile flow of the patients taking ursodiol. Because clinical trials are conducted under widely varying conditions, adverse reaction rates observed in the clinical trials of a drug cannot be directly compared to rates in the clinical trials of another drug and may not reflect the rates observed in clinical practice.The following table summarizes the adverse reactions observed in two placebo-controlled clinical trials.Note: Those adverse reactions occurring at the same or higher incidence in the placebo as in the UDCA group have been deleted from this table (this includes diarrhea and thrombocytopenia at 12 months, nausea/vomiting, fever and other toxicity).ADVERSE REACTIONS VISIT AT 12 MONTHS VISIT AT 24 MONTHS UDCA n (%) Placebo n (%) UDCA n (%) Placebon (%) Diarrhea ------1 (1.32) ---Elevated creatinine ------1 (1.32) ---Elevated blood glucose 1 (1.18) ---1 (1.32) ---Leukopenia ------2 (2.63) ---Peptic ulcer ------1 (1.32) ---Skin rash ------2 (2.63) --Thrombocytopenia ------1 (1.32) ---UDCA = Ursodeoxycholic acid = UrsodiolIn a randomized, cross-over study in sixty PBC patients, seven patients (11.6%) reported nine adverse reactions: abdominal pain and asthenia (1 patient), nausea (3 patients), dyspepsia (2 patients) and anorexia and esophagitis (1 patient each). One patient on the twice a day regimen (total dose 1000 mg) withdrew due to nausea. All of these nine adverse reactions except esophagitis were observed with the twice a day regimen at a total daily dose of 1000 mg or greater. However, an adverse reaction may occur at any dose. Bile acid sequestering agents such as cholestyramine and colestipol may interfere with the action of ursodiol tablets, 250 mg and 500 mg by reducing its absorption. Aluminum-based antacids have been shown to adsorb bile acids in vitro and may be expected to interfere with ursodiol tablets, 250 mg and 500 mg in the same manner as the bile acid sequestering agents. Estrogens, oral contraceptives, and clofibrate (and perhaps other lipid-lowering drugs) increase hepatic cholesterol secretion and encourage cholesterol gallstone formation and hence may counteract the effectiveness of ursodiol tablets, 250 mg and 500 mg.
Pregnancy Category B. Reproduction studies have been performed in pregnant rats at oral doses up to 22 times the recommended maximum human dose (based on body surface area) and in pregnant rabbits at oral doses up to 7 times the recommended maximum human dose (based on body surface area) and have revealed no evidence of impaired fertility or harm to the fetus due to ursodiol. There are no adequate or well-controlled studies in pregnant women. Because animal reproduction studies are not always predictive of human response, this drug should be used during pregnancy only if clearly needed. It is not known whether ursodiol is excreted in human milk. Because many drugs are excreted in human milk, caution should be exercised when ursodiol tablets, 250 mg and 500 mg are administered to a nursing mother. 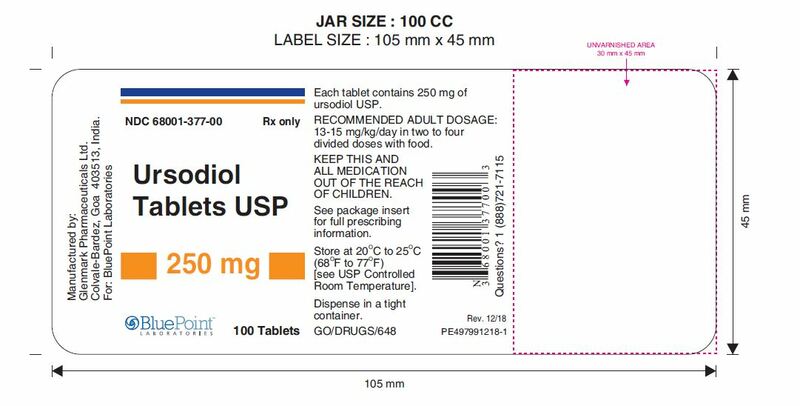 The safety and effectiveness of ursodiol tablets, 250 mg and 500 mg in pediatric patients have not been established. There have been no reports of accidental or intentional overdosage with ursodiol. Single oral doses of ursodiol at 10 g/kg in mice and dogs, and 5 g/kg in rats were not lethal. A single oral dose of ursodiol at 1.5 g/kg was lethal in hamsters. Symptoms of acute toxicity were salivation and vomiting in dogs, and ataxia, dyspnea, ptosis, agonal convulsions and coma in hamsters. Ursodiol tablets USP, 250 mg are available as film-coated tablets for oral administration. Ursodiol tablets USP, 500 mg are available as scored film-coated tablets for oral administration. 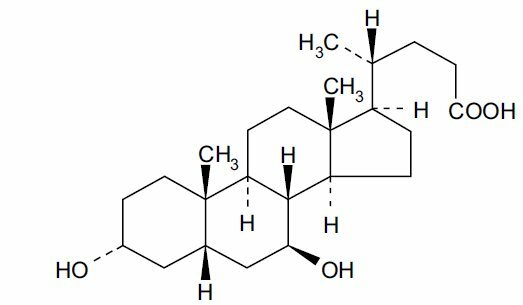 Ursodiol (ursodeoxycholic acid, UDCA) is a naturally occurring bile acid found in small quantities in normal human bile and in larger quantities in the biles of certain species of bears. It is a white crystalline powder, practically insoluble in water, freely soluble in alcohol, slightly soluble in acetone and in methylene chloride . The chemical name of ursodiol is 3α,7ß-dihydroxy-5ß-cholan-24-oic acid (C24H40O4). Ursodiol has a molecular weight of 392.6. Its structure is shown below:Inactive ingredients: microcrystalline cellulose, povidone, sodium starch glycolate, magnesium stearate, ethylcellulose, dibutyl sebacate, carnauba wax, hypromellose, PEG 3350, PEG 8000, cetyl alcohol and sodium lauryl sulfate. Ursodiol, a naturally occurring hydrophilic bile acid, derived from cholesterol, is present as a minor fraction of the total human bile acid pool. Oral administration of ursodiol increases this fraction in a dose related manner, to become the major biliary acid, replacing/displacing toxic concentrations of endogenous hydrophobic bile acids that tend to accumulate in cholestatic liver disease. In addition to the replacement and displacement of toxic bile acids, other mechanisms of action include cytoprotection of the injured bile duct epithelial cells (cholangiocytes) against toxic effects of bile acids, inhibition of apotosis of hepatocytes, immunomodulatory effects, and stimulation of bile secretion by hepatocytes and cholangiocytes. Lithocholic acid, when administered chronically to animals, causes cholestatic liver injury that may lead to death from liver failure in certain species unable to form sulfate conjugates. Ursodiol is 7-dehydroxylated more slowly than chenodiol. For equimolar doses of ursodiol and chenodiol, steady state levels of lithocholic acid in biliary bile acids are lower during ursodiol administration than with chenodiol administration. Humans and chimpanzees can sulfate lithocholic acid. Although liver injury has not been associated with ursodiol therapy, a reduced capacity to sulfate may exist in some individuals. Ursodiol (UDCA) is normally present as a minor fraction of the total bile acids in humans (about 5%). Following oral administration, the majority of ursodiol is absorbed by passive diffusion and its absorption is incomplete. Once absorbed, ursodiol undergoes hepatic extraction to the extent of about 50% in the absence of liver disease. As the severity of liver disease increases, the extent of extraction decreases. In the liver, ursodiol is conjugated with glycine or taurine, then secreted into bile. These conjugates of ursodiol are absorbed in the small intestine by passive and active mechanisms. The conjugates can also be deconjugated in the ileum by intestinal enzymes, leading to the formation of free ursodiol that can be reabsorbed and reconjugated in the liver. Nonabsorbed ursodiol passes into the colon where it is mostly 7-dehydroxylated to lithocholic acid. Some ursodiol is epimerized to chenodiol (CDCA) via a 7-oxo intermediate. Chenodiol also undergoes 7-dehydroxylation to form lithocholic acid. These metabolites are poorly soluble and excreted in the feces. A small portion of lithocholic acid is reabsorbed, conjugated in the liver with glycine, or taurine and sulfated at the 3 position. The resulting sulfated lithocholic acid conjugates are excreted in bile and then lost in feces. In healthy subjects, at least 70% of ursodiol (unconjugated) is bound to plasma protein. No information is available on the binding of conjugated ursodiol to plasma protein in healthy subjects or PBC patients. Its volume of distribution has not been determined, but is expected to be small since the drug is mostly distributed in the bile and small intestine. Ursodiol is excreted primarily in the feces. With treatment, urinary excretion increases, but remains less than 1% except in severe cholestatic liver disease. During chronic administration of ursodiol, it becomes a major biliary and plasma bile acid. At a chronic dose of 13 to 15 mg/kg/day, ursodiol constitutes 30-50% of biliary and plasma bile acids. In two 24-month oral carcinogenicity studies in mice, ursodiol at doses up to 1,000 mg/kg/day (3,000 mg/m2/day) was not tumorigenic. Based on body surface area, for a 50 kg person of average height (1.46 m2 body surface area), this dose represents 5.4 times the recommended maximum clinical dose of 15 mg/kg/day (555 mg/m2/day).In a two-year oral carcinogenicity study in Fischer 344 rats, ursodiol at doses up to 300 mg/kg/day (1,800 mg/m2/day, 3.2 times the recommended maximum human dose based on body surface area) was not tumorigenic.In a life-span (126-138 weeks) oral carcinogenicity study, Sprague-Dawley rats were treated with doses of 33 to 300 mg/kg/day, 0.4 to 3.2 times the recommended maximum human dose based on body surface area. Ursodiol produced a significantly (p<0.5, Fisher's exact test) increased incidence of pheochromocytomas of the adrenal medulla in females of the highest dose group. In 103-week oral carcinogenicity studies of lithocholic acid, a metabolite of ursodiol, doses up to 250 mg/kg/day in mice and 500 mg/kg/day in rats did not produce any tumors. In a 78-week rat study, intrarectal instillation of lithocholic acid (1 mg/kg/day) for 13 months did not produce colorectal tumors. A tumor-promoting effect was observed when it was administered after a single intrarectal dose of a known carcinogen N-methyl-N'-nitro-N-nitrosoguanidine. On the other hand, in a 32-week rat study, ursodiol at a daily dose of 240 mg/kg (1,440 mg/m2, 2.6 times the maximum recommended human dose based on body surface area) suppressed the colonic carcinogenic effect of another known carcinogen azoxymethane.Ursodiol was not genotoxic in the Ames test, the mouse lymphoma cell (L5178Y, TK+/-) forward mutation test, the human lymphocyte sister chromatid exchange test, the mouse spermatogonia chromosome aberration test, the Chinese hamster micronucleus test and the Chinese hamster bone marrow cell chromosome aberration test.Ursodiol at oral doses of up to 2,700 mg/kg/day (16,200 mg/m2/day, 29 times the recommended maximum human dose based on body surface area) was found to have no effect on fertility and reproductive performance of male and female rats. A U.S., multicenter, randomized, double-blind, placebo-controlled study was conducted to evaluate the efficacy of ursodeoxycholic acid at a dose of 13 to 15 mg/kg/day, administered in 3 or 4 divided doses in 180 patients with PBC (78% received four times a day dosage). Upon completion of the double-blind portion, all patients entered an open-label active treatment extension phase. Treatment failure, the main efficacy end point measured during this study, was defined as death, need for liver transplantation, histologic progression by two stages or to cirrhosis, development of varices, ascites or encephalopathy, marked worsening of fatigue or pruritus, inability to tolerate the drug, doubling of serum bilirubin and voluntary withdrawal. After two years of double-blind treatment, the incidence of treatment failure was significantly (p<0.01) reduced in the ursodiol tablets 250 mg group (20 of 86 (23%)) as compared to the placebo group (40 of 86 (47%)). Time to treatment failure, which excluded doubling of serum bilirubin and voluntary withdrawal, was also significantly (p<0.001) delayed in the ursodiol tablets 250 mg treated group (n=86, 803.8±24.9 d vs. 641.1±24.4 d for the placebo group (n=86) on average) regardless of either histologic stage or baseline bilirubin levels (>1.8 or <1.8 mg/dl). Using a definition of treatment failure, which excluded doubling of serum bilirubin and voluntary withdrawal, time to treatment failure was significantly delayed in the ursodiol tablets 250 mg group. In comparison with placebo, treatment with ursodiol tablets 250 mg resulted in a significant improvement in the following serum hepatic biochemistries when compared to baseline: total bilirubin, SGOT, alkaline phosphatase and IgM. A second study conducted in Canada randomized 222 PBC patients to ursodiol, 14 mg/kg/day or placebo, administered as a once daily dose in a double-blind manner during a two-year period. At two years, a statistically significant (p<0.001) difference between the two treatments (n=106 for the ursodiol tablets 250 mg group and n=106 for the placebo group), in favor of ursodiol, was demonstrated in the following: reduction in the proportion of patients exhibiting a more than 50% increase in serum bilirubin; median percent decrease in bilirubin (-17.12% for the ursodiol tablets 250 mg group vs. +20% for the placebo group), transaminases (-40.54% for the ursodiol tablets 250 mg group vs. +5.71% for the placebo group) and alkaline phosphatase (-47.61% for the ursodiol tablets 250 mg group vs. -5.69% for the placebo group); incidence of treatment failure; and time to treatment failure. The definition of treatment failure included: discontinuing the study for any reason; a total serum bilirubin level greater than or equal to 1.5 mg/dl or increasing to a level equal to or greater than two times the baseline level; and the development of ascites or encephalopathy. Evaluation of patients at 4 years or longer was inadequate due to the high drop out rate (n=10 withdrew from the ursodiol tablets 250 mg group vs. n=15 from the placebo group) and small number of patients. Therefore, death, need for liver transplantation, histological progression by two stages or to cirrhosis, development of varices, ascites or encephalopathy, marked worsening of fatigue or pruritus, inability to tolerate the drug, doubling of serum bilirubin and voluntary withdrawal were not assessed. A randomized, two-period crossover study in fifty PBC patients compared efficacy of ursodiol tablets 250 mg in twice a day versus four times a day divided dosing schedules in 50 patients for 6 months in each crossover period. Mean percent changes from baseline in liver test results and Mayo risk score (n=46) and serum enrichment with UDCA (n=34) were not statistically significant with any dosage at any time interval. This study demonstrated that UDCA (13 to 15 mg/kg/day) given twice a day is equally effective to UDCA given four times a day. In addition, ursodiol tablets 250 mg was given as a single versus three times a day dosing schedules in 10 patients. Due to the small number of patients in this arm of the study, it was not possible to conduct statistical comparisons between these regimens. Each ursodiol tablet USP, 250 mg is a white to off-white, oval shaped, film-coated tablet debossed with “G72” on one side and “250” on the other side and contains 250 mg ursodiol USP. Ursodiol tablets USP, 250 mg are available in: NDC 68001-377-00, bottles of 100 tablets. Patients with the following conditions should be instructed to receive appropriate management measures: variceal bleeding, hepatic encephalopathy, ascites, in need of an urgent liver transplant or hepatic function deterioration [see Warnings and Precautions (5)].Caution has to be exercised to maintain the bile flow of the patients taking ursodiol. Patients should be informed that absorption of ursodiol tablets, 250 mg and 500 mg may be reduced if they are taking bile acid sequestering agents, such as cholestyramine and colestipol, aluminum-based antacids, or drugs known to alter the metabolism of cholesterol [see Drug Interactions (7)].